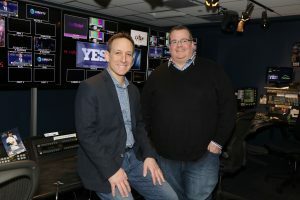 As the New York Yankees wrap up Spring Training and embark on their latest quest for the franchise’s 28th World Series, YES Network is eyeing another successful season from its headquarters in Stamford, CT. The offseason has been a busy one for both the men in pinstripes and the people who put them on the air, but, as some things change, others remain the same. 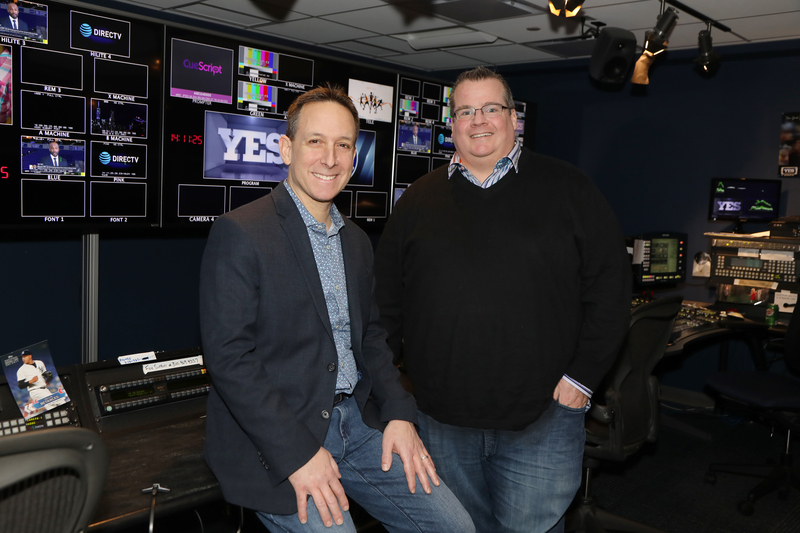 In their 18th season at the network (their 20th in the industry), YES Network’s Jared Boshnack, coordinating producer, studio, and Bill Boland, lead game producer, have stayed committed to a heavy diet of communication, cooperation, and interconnectivity. The symbiosis between Boshnack’s studio programming and Boland’s production of the television broadcast has brought synergy to the two camps. Although they plan their respective chunks of the day independently, there is always a constant flow of collaboration. For the work that goes on inside the network’s signature production truck, Game Creek Video’s Yogi, he blocks off at least two hours to scavenge through social media and other resources to determine what’s going on around the league. On the studio side, planning for the pregame show is a stringent process. With a 7 p.m. first pitch, Boshnack is in the building at 3:00 p.m., crafting the script that will set the table for that night’s game. Although there is a formatted structure for the show, he can relax a bit after the final pitch and approach the game recap with spontaneity. The duo’s diligent preparation makes for a successful slate of day-long entertainment, but the magic happens when Boshnack and Boland adapt on the fly. In addition to prepackaged content developed before the action starts, Boland will throw it over to the studio crew during the fourth and seventh innings for live, sponsored look-ins at the latest news, notes, and updates from games being played simultaneously. When breaking news occurs, they rely on working with each other. Digital platforms that have become integrated with the linear telecast receive their fair share of exposure as well. For example, Boshnack’s involvement with the Facebook Live show will get airtime on Boland’s in-game broadcasts. Whether there’s a plan of attack or decisions are made off-the-cuff, there is a sense of continuity that provides uninterrupted content from both sides of the operation. Given all the new creations of last season, the YES Network is looking to build on the experience gained in 2018. 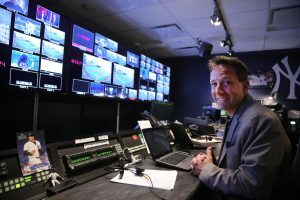 From an operations perspective, all home games at Yankee Stadium were captured by 16 Sony HDC-4300 cameras with complete super-slo-mo playback ranging from 2X to 8X. After an entire year with this technology, Boland and his team want to expand its use. In addition, YES Network will alter some on-screen graphics, including a more subtle and less obtrusive PitchCast strike zone, and also will incorporate context into sabermetrics and analytics on StatCast. These improvements will be aided by MLB’s Elliot Weiss, senior coordinating producer, broadcast products and services, and Ryan Zander, VP, broadcast products and services. The preproduction meeting is just one example of YES Network’s use on Facebook Live. The talent in the booth will have a somewhat new look with the departure of former Yankees hurler Al Leiter. After coming out of retirement, Ken Singleton is back in a reduced role, doing a majority of his work on road games in Baltimore. The voices of Michael Kay, Cone, and former Yankees outfielder Paul O’Neill are back in full strength. The studio portion has also made strides in explaining the more nuanced details of the game to the fan. Flash Focus, starring analyst and former Yankees catcher John Flaherty, will take a deep dive into the art of catching, including discussions on framing, blocking, pitcher positioning on the mound, and pitch sequences. Additional programming will honor both national and baseball-centric holidays (Jackie Robinson Day, Mother’s Day, Memorial Day, Fourth of July, and Father’s Day) and celebrate some of the most notable anniversaries in Yankees history: for example, the 1999 and 2009 World Series teams, Cone’s perfect game, the 10th anniversary of Hope Week, the death of captain Thurman Munson, and the 1949 divisional race against the Boston Red Sox. Special occasions in the 2019 season that involve the Yankees and the city of New York will be commemorated as well, including features on the 50th anniversary of the Stonewall Riots, the 73rd Old Timers’ Day, coverage of the Yankees’ two-game series in London with the help of clubhouse reporter Meredith Marakovits and play-by-play/host/reporter Ryan Ruocco, and exclusive reports by analyst Jack Curry from Cooperstown during Mariano Rivera’s and Mike Mussina’s inductions into the National Baseball Hall of Fame. As fans indulge in a full menu of new offerings, the physical set of the YES Network studio will continue its design evolution. After a tumultuous winter that saw star-studded outfielder Bryce Harper join the Philadelphia Phillies and hot-corner aficionado Manny Machado head west to San Diego, the Bronx Bombers countered with a handful of moves and acquisitions of their own. As the borough buzzes with tons of storylines (the signings of Troy Tulowitzki/DJ LeMahieu/James Paxton/Adam Ottavino, the youth movement led by Gleyber Torres, and the wave of power headlined by Aaron Judge and Giancarlo Stanton), the YES Network is doing all it can to highlight the ballplayers and the tales that surround them. Marakovits is spearheading an effort to paint a better picture of who the players are away from the diamond in a segment called “One for Three,” a one-on-one conversation that comes with a side of three specific questions. With the same initiative in mind, accounts on social media will play their role in presenting candid moments of the on-air personalities. The Facebook Live show will act as an appetizer before every series, but, on Instagram, IGTV will give sneak peeks behind the scenes at the Stamford studios with studio anchor Bob Lorenz and the others. On linear television, the Yankees Batting Practice Show (produced by Josh Isaac and hosted by a rotating trio of Chris Shearn, Nancy Newman, and Michael Grady) will emphasize the sheer strength of the lineup by showcasing home-run blasts inside the cage. “As far as the storylines go, there are a million of them,” says Boland. “Put YES on, put the remote down, and settle in for the night. Boshnack and Boland’s long-lasting relationship has inspired two groups of professionals who are able to perform in sync with each other. Besides creating a network of determined workers, Boshnack and Boland can take credit for a large part of the regional sports network’s foundation. Since 2003, the Yankees flagship station has earned 24 Emmy Awards for studio programming and game coverage (in addition to a number of nominations in 2019). They have been part of the network’s highest moments (the final seasons of Derek Jeter and Rivera) as well as its lowest (the deaths of owner George Steinbrenner and 10-time World Series champion Yogi Berra). Through the highs and the lows, the YES Network has fostered a feeling of family. For Boland, a sense of pride comes with the start of every season and the fact that relishing the past can lead to greater success in the future.